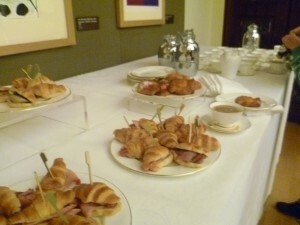 On Friday, I had the great pleasure of being invited to the Bloggers’ Breakfast at the Queen’s Gallery, Buckingham Palace, to a preview of the new exhibition, Maria Merian’s Butterflies. We had to be there by 8.30am – something of a shock to the system as I discovered that, even at 7.45am, it was standing room only on the Victoria line. Fortunately, a choice of tea, coffee or fruit juice and a variety of delicious pastries awaited us on arrival. There was time to meet the other bloggers, together with the curators of the exhibitions. Kate Heard, curator of Maria Merian’s Butterflies, showed us round the exhibition and her knowledge and enthusiasm were infectious. 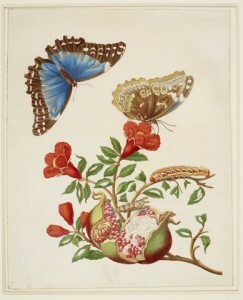 Maria Sibylla Merian was born in Frankfurt in 1647 and brought up by her step-father, the flower and still-life painter, Jacob Marrel. 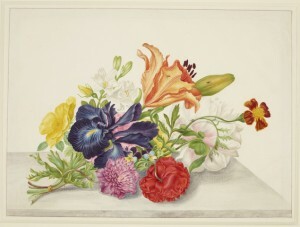 He recognized her precocious talent and taught her to draw and paint flowers – seen as a suitably feminine occupation. But Maria had always been fascinated by insects. As a girl, she had kept silk moths to work out their life cycle. Bugs and flies in the 17th century were thought of as ugly and repulsive and, throughout her life, Maria’s interest in them was viewed as ‘odd’. At the time, there were a lot of misconceptions about where moths and butterflies came from and their connection with caterpillars and chrysalises was not really understood. Sadly, her personal life wasn’t fated to be happy. She married, had two daughters, Joanna and Dorothea, and in 1651, after selling the entire contents of her studio, she left her husband and moved with her daughters to Amsterdam in the Netherlands. Suddenly, she was in exactly the right place at the right time. Amsterdam was a major port with goods from the Dutch colonies flooding in – including specimens of rare plants, birds and insects. In 1699, when she was fifty-two, she was granted permission to go to Suriname, a Dutch colony in South America, a place she’d long wanted to visit. What strikes me forcibly is her self-belief. She knew exactly what she wanted to do: illustrate new species of insects and to understand the way they metamorphosed. And she sold 255 of her own paintings in order to finance the trip. She and Dorothea set sail and arrived in the September of that year. 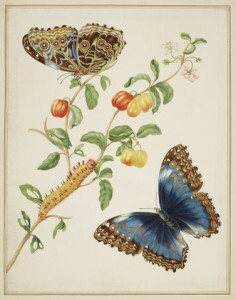 Merian usually included all three stages: caterpillar, chrysalis and butterfly in her paintings to show what her chosen insect looked like as each stage of its life. You can see the brown caterpillar lying along the lower right hand stem of the painting above and, if you have a magnifying glass, a minute chrysalis looking like a papoose with two little horns lying across the base of that stem. Kate pointed out that Merian drew everything life-size. I was astonished, going round, to see that some of the butterflies were large enough to cover my hand. I’d assumed that, in reality, they’d be much smaller. 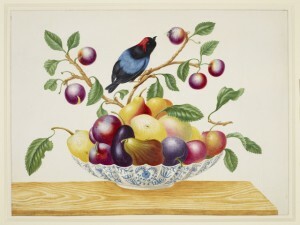 You can see this illustrated in the above picture, if you bear in mind the usual size of wild cherries. 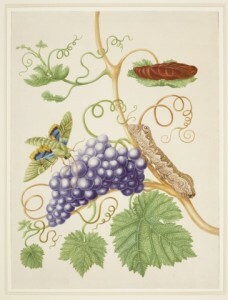 Merian travelled widely in Surinam; she wanted to see the insects in their natural habitat. She was fully aware of the importance of different insects’ food host plants and knew, from careful observation, that certain plants hosted only certain insect species and that their inter-dependence was crucial. Again, I’d assumed that she’d painted her insects on any suitably decorative plant. Not so. The plants she painted were used specifically by the insects she placed on them. 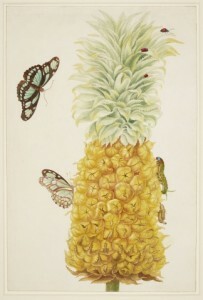 Merian adored the taste of pineapple, describing it as ‘an unsurpassable flavour’. I found myself thinking that, yes, it’s good but somehow one always ends up with bits of it between one’s teeth. Maybe ripe pineapples in Surinam are different. Unfortunately, she fell ill with malaria and returned to Amsterdam two years later. She set about preparing her life’s work in Metamorphosis Insectiorum Surinamensium (The Metamorphosis of Insects in Surinam) which came out in 1705. Merian died in Amsterdam in 1717. Her reputation today is deservedly high, not only for the beauty and accuracy of her paintings but also for her meticulous research. She was, arguably, the first ecologist. And, as I hope you agree, her paintings are wonderful! Kate’s introduction to Maria Sibylla Merian was absolutely fascinating and I came out feeling energized. I thought, all this and coffee and a delicious pain au chocolat, too! What an extraordinary woman! It would be quite some feat to achieve what she did in the 21st century, yet she seems to have been undaunted by conditions prevailing in the 17th century, not least the attitudes towards women. And all this without the ‘protection’ of a man. She did owe a lot to her father who spotted her talent and nurtured it, even if he did try to steer her towards lady like subjects. I agree, Prem. Unfortunately, when she started including flies and spiders, she came in for criticism/ They were viewed as ‘disgusting’ and what was a respectable woman doing painting such revolting creatures?